At Sigma 6 Electronics, we specialize in designing and manufacturing the most reliable and effective membrane switch solutions to best serve the needs of our clients. We often encounter visitors to our site who are new to the technology and looking for resources for understanding our technologies, starting by going over some of the basics into what makes up a membrane switch. Depending on the environment and requirements of the device, the construction can change. For example, certain applications would lend to replacing a printed silver circuit with a rigid printed circuit board or a high temp polyimide circuit layer. The adhesive backer layer is the bottom layer, and serves as a foundation in adhering to the many different finishes on a product’s housing. Sandwiched between the top overlay and circuit layers is the adhesive separator,which may be used in securing actuating metal domes, integrated LED’s and back lighting elements. Finally, the graphic overlay provides the products first appearance and feel. One can find membrane switches on just about any household appliance, industrial control panels such as HVAC units and numerous medical and scientific devices. The solution has been adopted by a wide range of industries as a preferred user interface device due to its thinness, longevity, durability, cost-effectiveness and esthetic appeal. 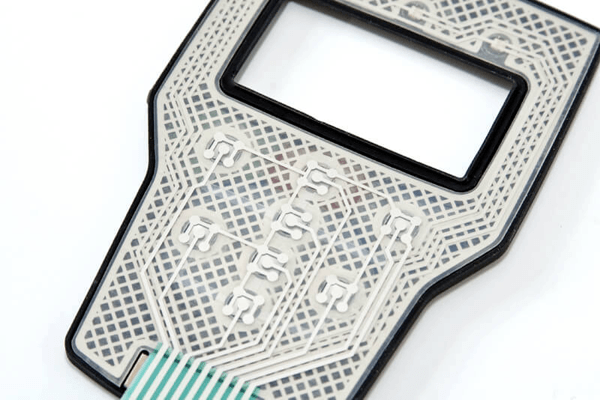 Custom solutions in a membrane switch design are available to differentiate products and meet industry regulations. For example, membrane switches for the medical industry must comply with strict FDA standards, and defense/military contractors will adhere to their own specifications. If you have any questions about membrane switches or their capabilities, reach out to our team of experts who will be happy to assist you.